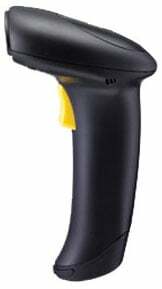 The CipherLab 1502 is able to read barcodes from 2 to 57 cm (0.8 to 22.4 inch) away. Its lightweight, ergonomic design eases repetitive use. The 1502 has an innovative 3-in-1 handsfree scanning, desktop, or wall mount stand for easy scanning. Test-proven to withstand multiple drops from 1.2 m (3.9 ft.) onto concrete, the 1502 Supports multiple languages and symbologies for worldwide applications, includes widely programmable ScanMaster software for free with purchase for data editing support, interface selection, and symbology configuration.